Do you want a cupcake cake for your child’s birthday party? Look no further than these amazing cupcakes cakes! Pull apart cupcake cakes are so popular right now for birthday parties, and it’s pretty easy to understand why. Pull apart cupcake cakes are so easy to make. 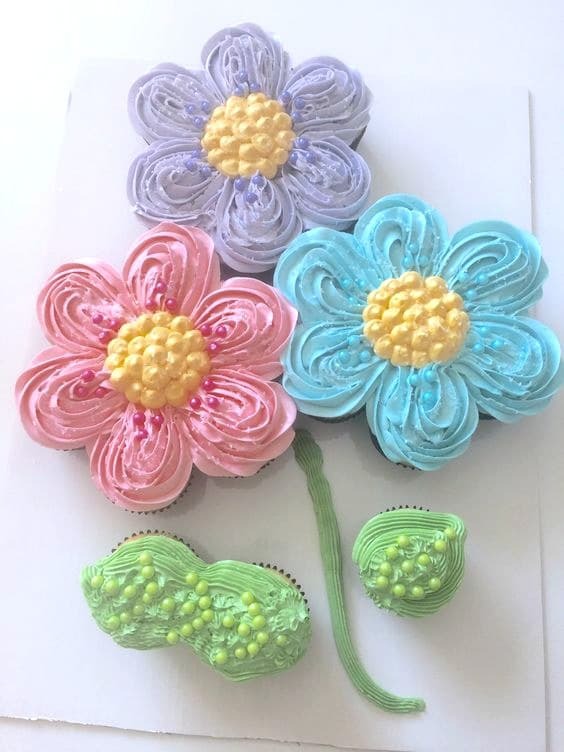 It’s a lot of fun to think of amazing cupcake cake designs, and they are usually a lot more affordable than baking or ordering a large 3D cake! Since they are basically just a bunch of cupcakes with different color frosting and some other toppings for decoration, you can even make them yourself! It’s easy to make a cupcake cake. And pull apart cupcake cakes are a great alternative to your traditional cake and are perfect for kids parties because they are definitely less messy and less wasteful! Looking for some awesome pull apart cupcake cake ideas? Here are our favorite 21 pull apart cupcake cake ideas so you can get some inspiration for your next party or event! Before we begin showing you some really gorgeous cupcake birthday cake designs, we want to help you make the baking experience so much easier. 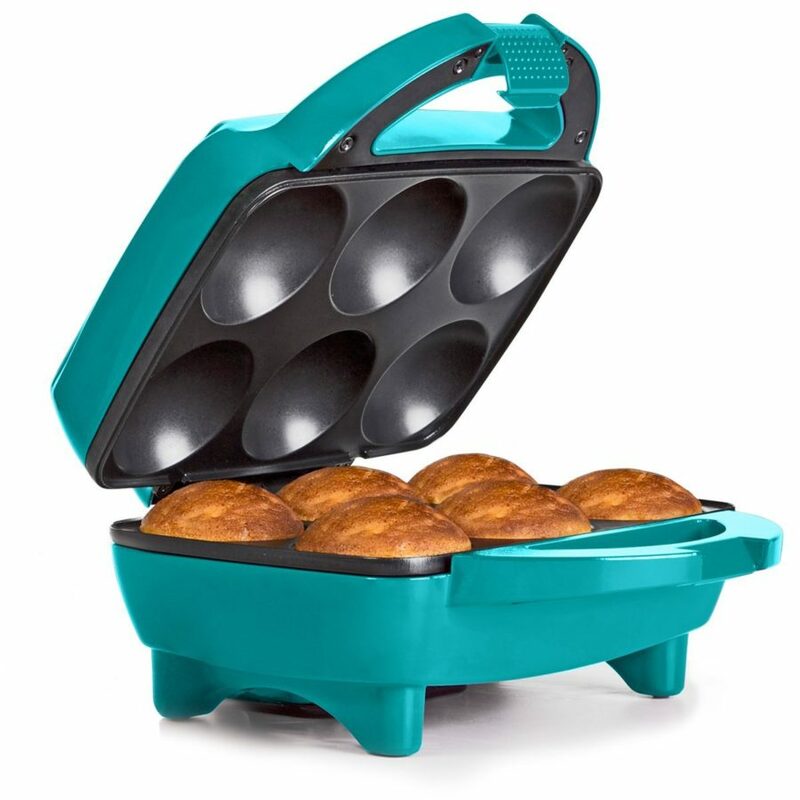 So if you’re going to be making a cupcake birthday cake yourself, check out Holstein Housewares Cupcake Maker. We tried it out last year and we absolutely loved it! It’s so quick and easy to use, and it’s perfect for those last-minute cupcakes for parties, school bake sales and more! 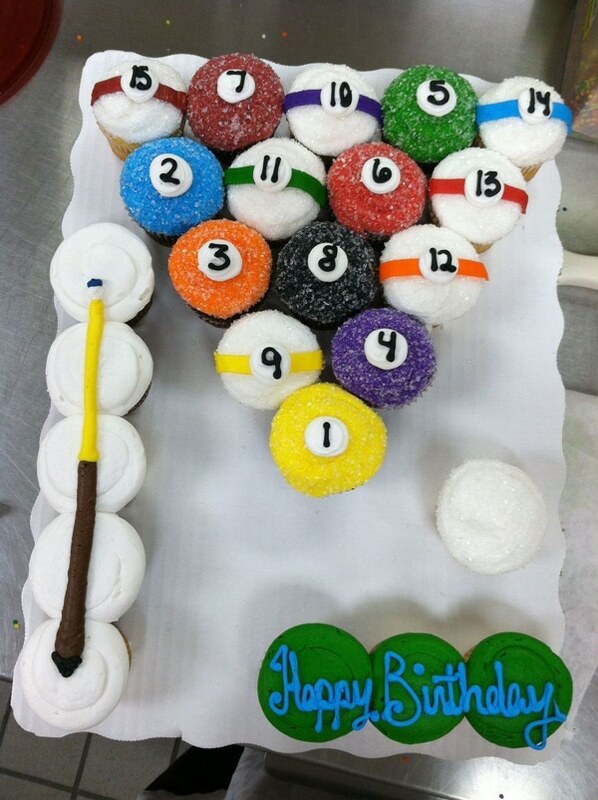 Pull Apart Cupcake Cake #1: Love a game of billiards? Celebrate with this awesome Billiards Pull Apart Cupcake Cake! You simply can’t go wrong with this one. It’s a cupcake cake that will make your little boy happy! Pull Apart Cupcake Cake #2: This adorable Butterfly Cupcake Cake will surely be a huge hit at your child’s birthday party. We love the color combination and cute smiley face on the butterfly too! Pull Apart Cupcake Cake #3: What a cute fish! 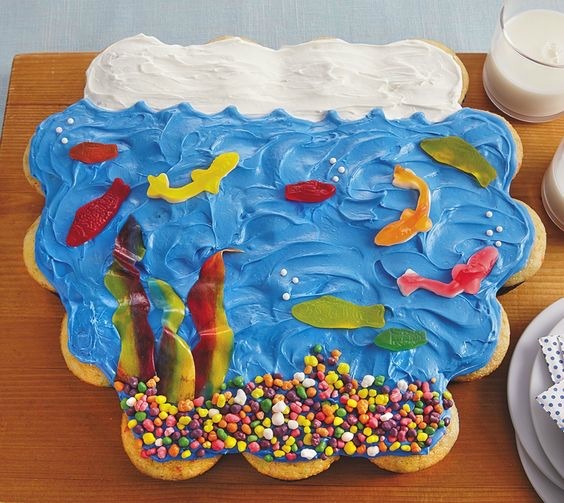 This fish-shaped cupcake cake will be a perfect fit for any under the sea themed party! Want to try your hand at it? 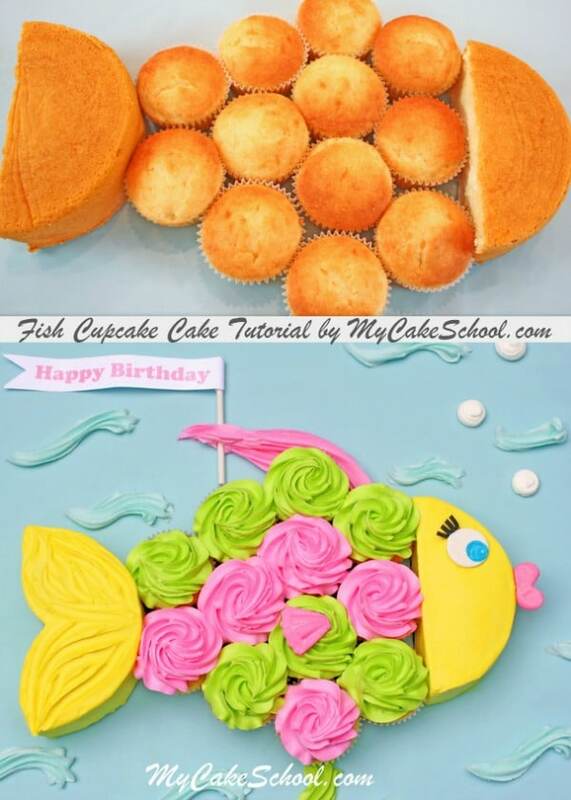 Check out this Fish Cupcake Cake Tutorial. Pull Apart Cupcake Cake #4: What’s the fairest cupcake cake of all? 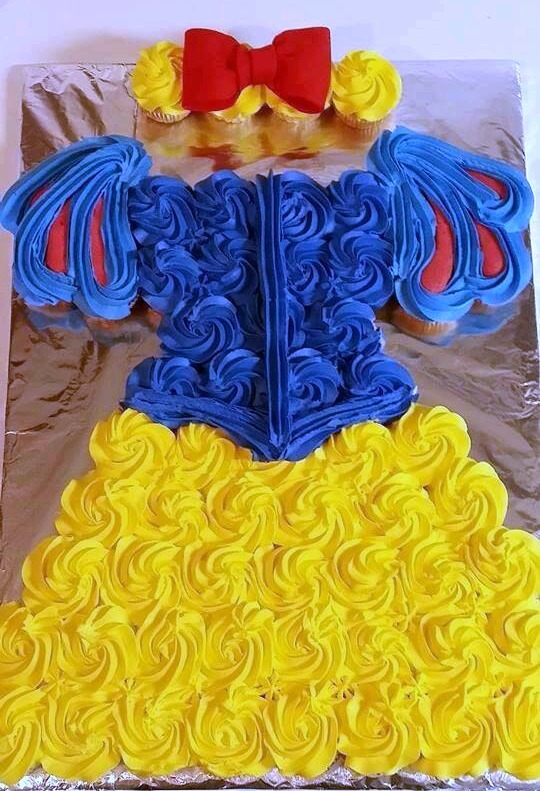 Why this Snow White Cupcake Dress Cake of course! The bright colors of the blue, red and yellow frosting definitely makes this cake stand out. What a great cupcake cake idea for a Snow White theme party. Pull Apart Cupcake Cake #5: Dainty and cute! This Flower Pull Apart Cupcake Cake will be a nice treat for some who loves pretty things and cute pastels. 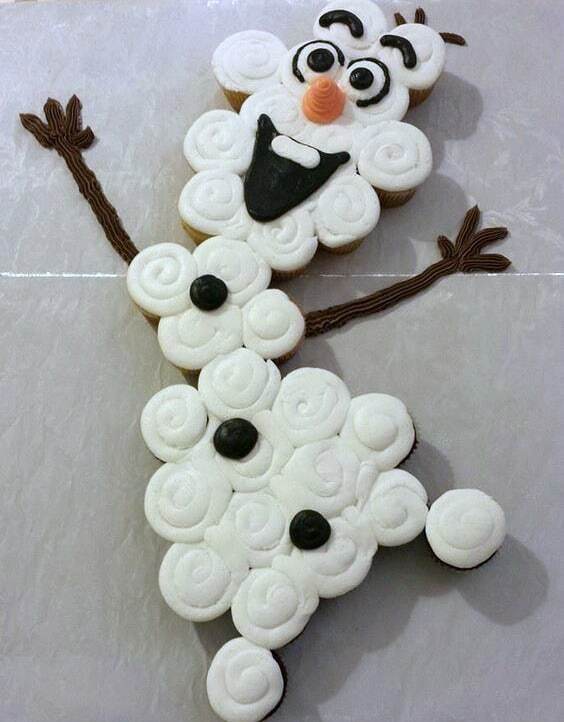 Pull Apart Cupcake Cake #6: If you want a Frozen cupcake cake for your Frozen themed party, this Olaf Pull Apart Cupcake Cake is a sure win! Pull Apart Cupcake Cake #7: Look how lovely this Minnie Mouse cupcake cake idea is for a Minnie Mouse themed party! 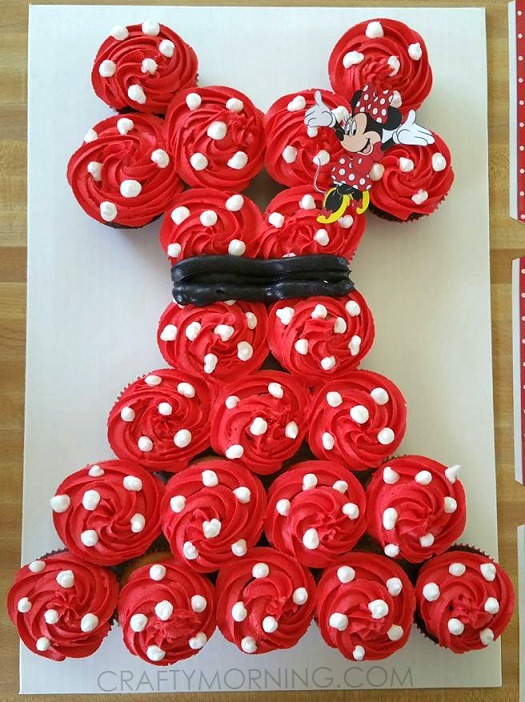 Her super recognizable red polka-dotted dress is easy to replicate with cupcakes, so you wouldn’t have a hard time doing this Minnie Mouse Pull Apart Cupcake Cake yourself. 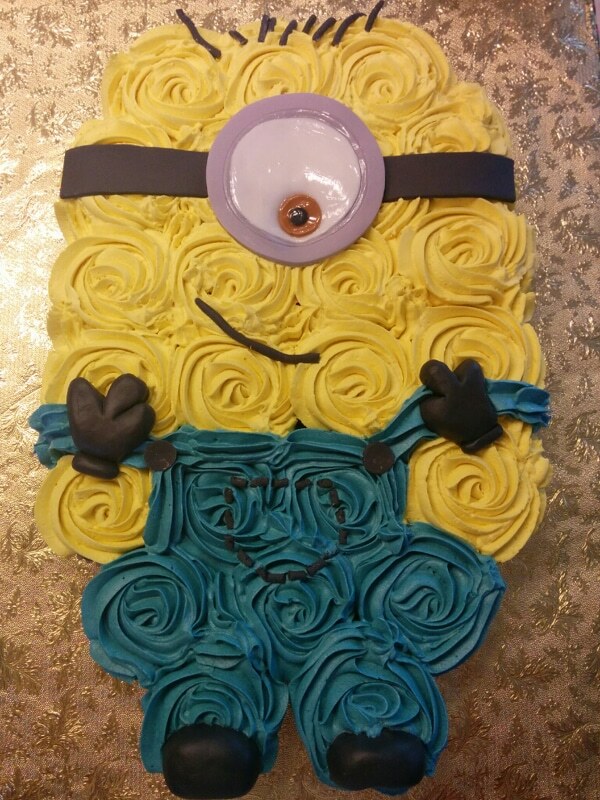 Pull Apart Cupcake Cake #8: Minions are some of the most popular characters for children right now. If your kids are huge fans of these little yellow creatures, they are going to love this Minion Pull Apart Cupcake Cake. 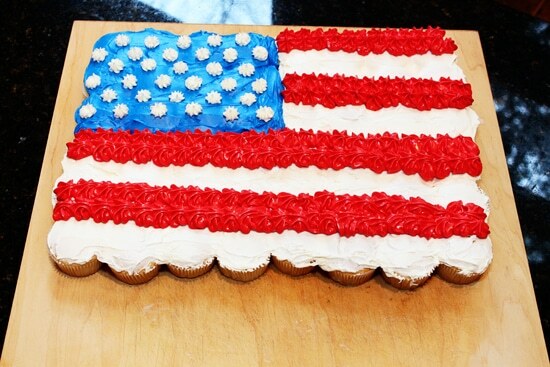 Pull Apart Cupcake Cake #9: If you want a patriotic cake for your next 4th of July party, check out this American Flag Cupcake Cake. Super easy to make, and it’s going to be a pretty and delicious treat for your party guests. It makes the perfect dessert for your summer BBQ! Pull Apart Cupcake Cake #10: Who says cupcake cakes are just for kid’s birthday parties? 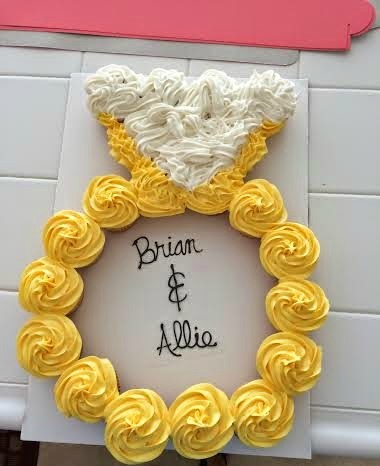 This “gold and diamond” Engagement Ring Cupcake Cake will be perfect for an engagement celebration. 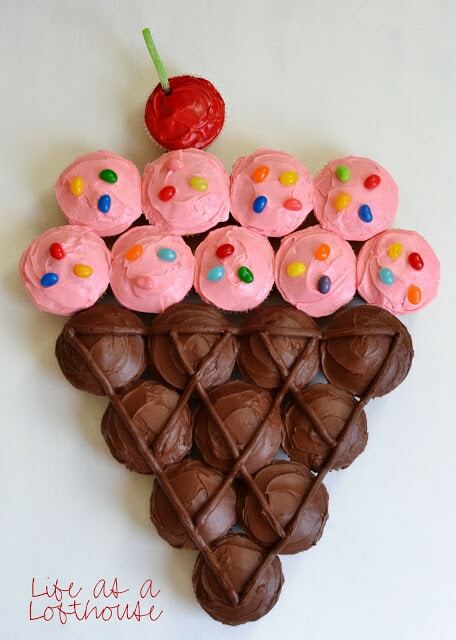 Pull Apart Cupcake Cake #11: Simple but sweet – that’s what we thought of when we saw this Ice Cream Cone Cupcake Cake. It’s a great cake for smaller parties or as an additional cake for an ice cream themed birthday party! 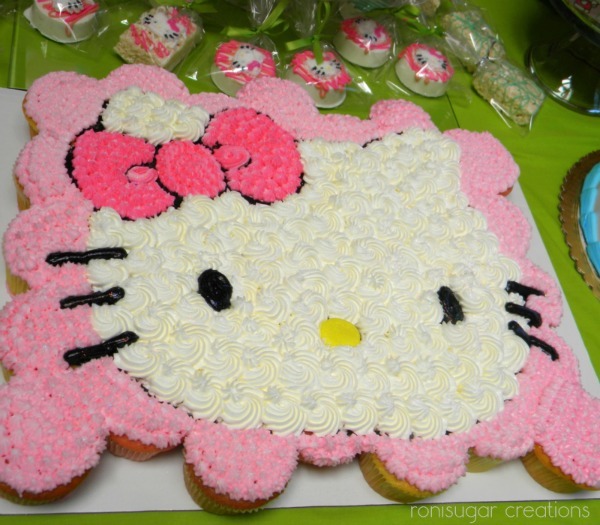 Pull Apart Cupcake Cake #12: Is your little princess a big fan of Hello Kitty? How about giving them one huge Hello Kitty cake made of cupcakes? This adorable Hello Kitty Cupcake Cake will look amazing on your dessert table. 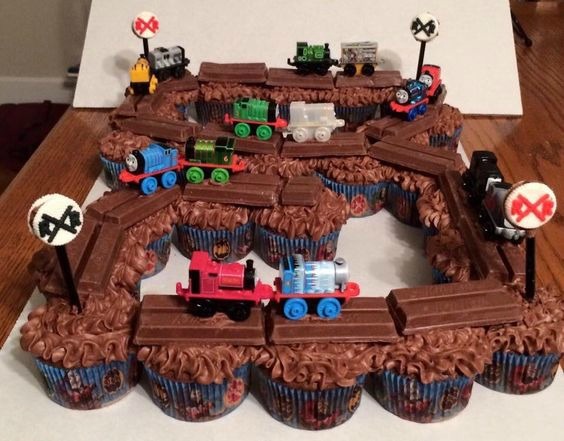 Pull Apart Cupcake Cake #13: Love this Thomas the Train Kit Kat Cupcake Cake! If you want a really attention-grabbing cake made of cupcakes for your kid’s Thomas the Train birthday party, this one is for you. Your little boys will have fun with the little toy trains on top with their KitKat rails! Pull Apart Cupcake Cake #14: Wow! 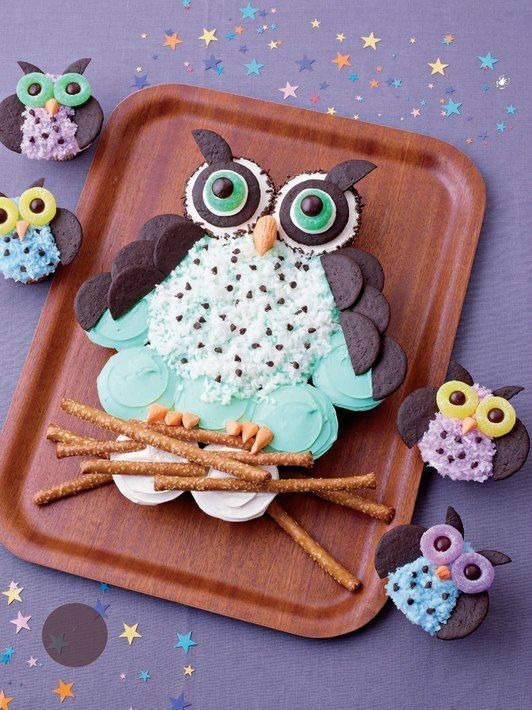 This gorgeous Owl Cupcake Cake is definitely one of the best cupcake cake ideas we’ve seen! From design to execution, it really takes the cake. From the large mommy owl to the tiny baby owlets, everything about this cake just looks so good. Perfect for your little night owls! Pull Apart Cupcake Cake #15: Is your kid a fan of Go Fish? Then go and make them this amazing Go Fish Cupcake Cake for their birthday! Some colorful rock candy and gummies are all you need to top your sea of cupcakes. 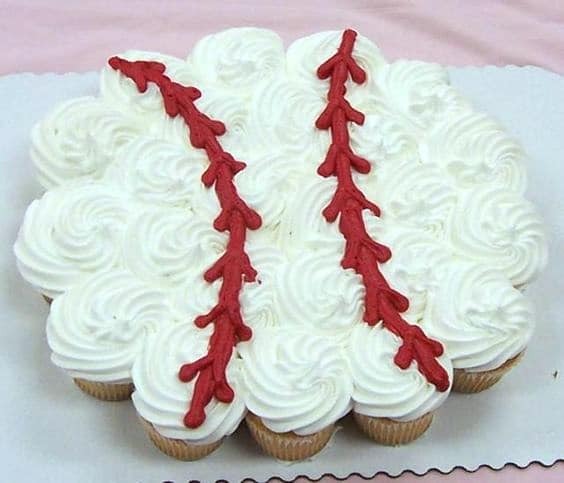 Pull Apart Cupcake Cake #16: Your little catcher or pitcher will have a ball with this Baseball Cupcake Cake! So simple, but so creative! It’s perfect for a baseball themed birthday party for a boy or girl! 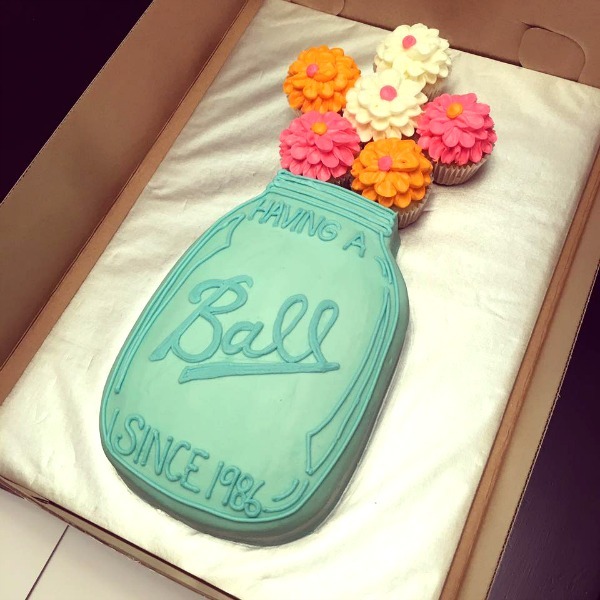 Pull Apart Cupcake Cake #17: How about a cute Ball mason jar themed cupcake shaped cake? Aside from the gorgeous detailing on the mason jar in this Ball Cupcake Cake, we also love the pops of colors on those beautifully piped flower cupcakes on top! Pull Apart Cupcake Cake #18: Love the swirly pastel rainbow frosting on this one! 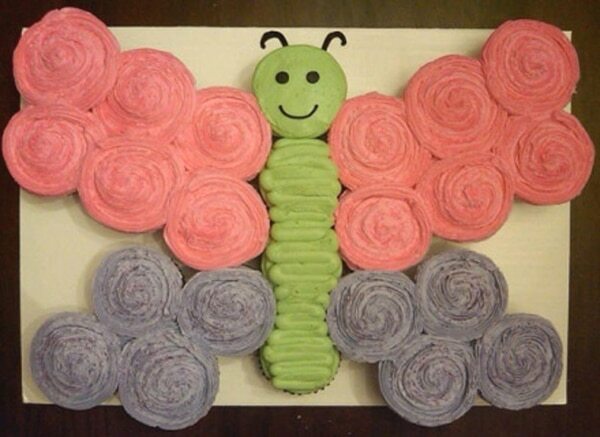 This Rainbow Butterfly Cupcake Cake is so creative and cute, and the tiny cupcake wings make it even more adorable! 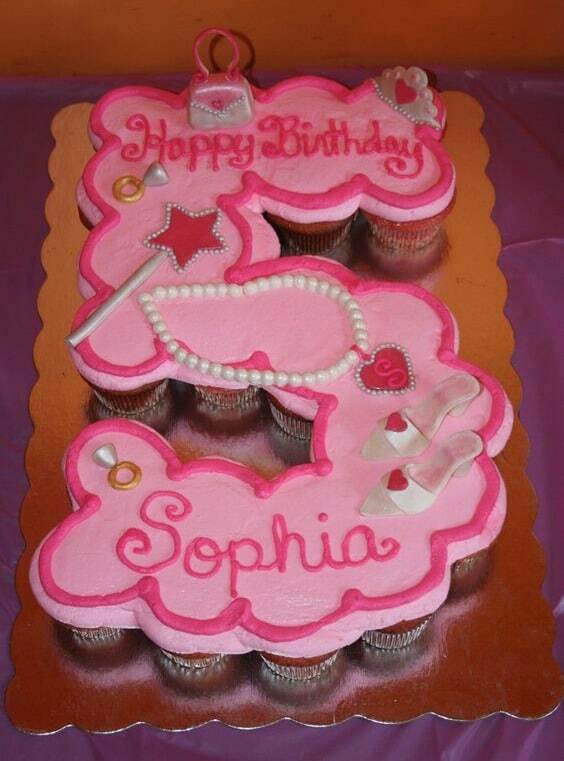 Pull Apart Cupcake Cake #19: Your little princess will adore this pink Princess Cupcake Cake. Cupcakes in shape of numbers are super popular these days, and this princess-themed number cupcake cake is definitely one of the best ones we found! Pull Apart Cupcake Cake #20: Do you have a little Peter Pan fan or wildlife lover? 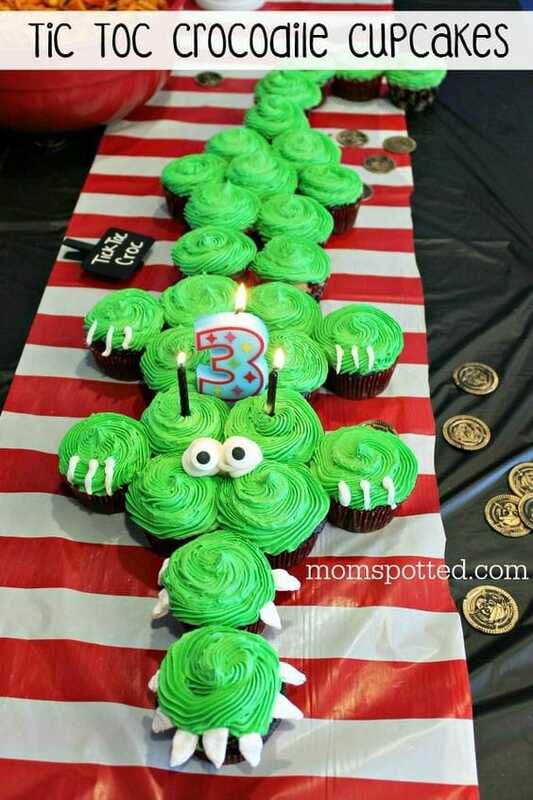 They are going to love this Tic Toc Croc Pirate Cupcake Cake! The bright green frosting and large scary teeth really make this a nice cupcake cake for boys! Pull Apart Cupcake Cake #21: Look how cute this Bee Hive Cupcake Cake is! It’s a perfect cake for your little busy bees! The adorable little chocolate bee candy melt toppers complete the whole look! Whether you want cupcakes for boys or cupcake cakes for girls, these 21 beautiful cupcake birthday cake ideas will definitely provide you with great design inspiration. What’s your favorite cupcake cake designs here? Let us know in the comments below! Wow, it’s hard to choose just one, they are all wonderful. If I had to choose only one, I think I’d choose the Owl pull-apart cupcakes. These Cup Cakes are awesome. They look so good and they must be delicious to taste.